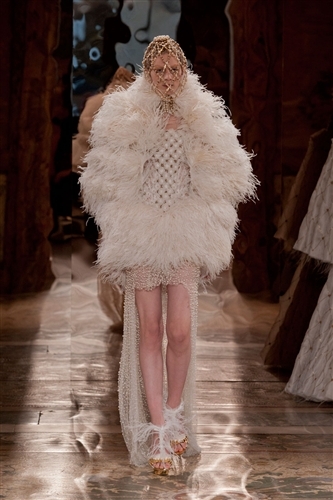 Sarah Burton showed a breathtakingly exquisite collection this season. The 10-look collection shone from beginning to end and showed the true talents of the designer. The ecclesial collection drew inspiration from the High Church and the finery you find in papal costume. Everything from delicate and lacey communion gowns to stiff and regal cardinal robes were referenced and recreated in a fashion forward and highly topical manner. 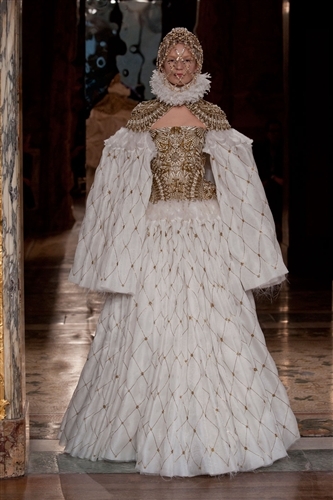 The references to traditional church garb continued further with inspiration taken from Elizabeth I and classic religious artwork. There was a suggestive element running through the designs with cutaway habits, hinting at not entirely virginal nuns and length after length of intricate lace that added a delicate seductive feel. The collection was perfectly formed and showed how effective a small number of exquisite designs can be.